Assets continue to work for your business long after the payments have stopped. An internet asset is something that continues to work for your business long after you have paid for it (except for registration and basic maintenance). Typical and important internet assets are your domain name (VERY important to control) and your website. Some semi-assets (assets that are under your control but are owned by third parties) include your Facebook and Google business pages, Twitter account, etc. Advertising disappears the moment you stop paying. Your DEX page, Google Adwords, your Hibu page and any other similar advertising disappears into a cloud of dust as soon as the payments stop. Does this mean that internet assets are always good and advertising is always bad? Not necessarily. Some advertising can be very productive. Take Google Adwords for example. Adwords can be a really good form of advertising for a local business, provided you use keywords effectively, target your audience sharply and send your clicks to a good landing page. Many local businesses do very well with a well-run Adwords campaign and the ROI (return on investment) is great! From my experience, expensive advertising on a Big Name directory page (probably the most common sales push) is like throwing your money down a black hole. The last client I advised learned that their advertising on a Big Name directory page had cost them about $150 per click – in an industry where the most expensive Adwords clicks cost about $4.50 each. They got a total of two clicks to their site for $300 in a month. You tell me if that’s a great deal. 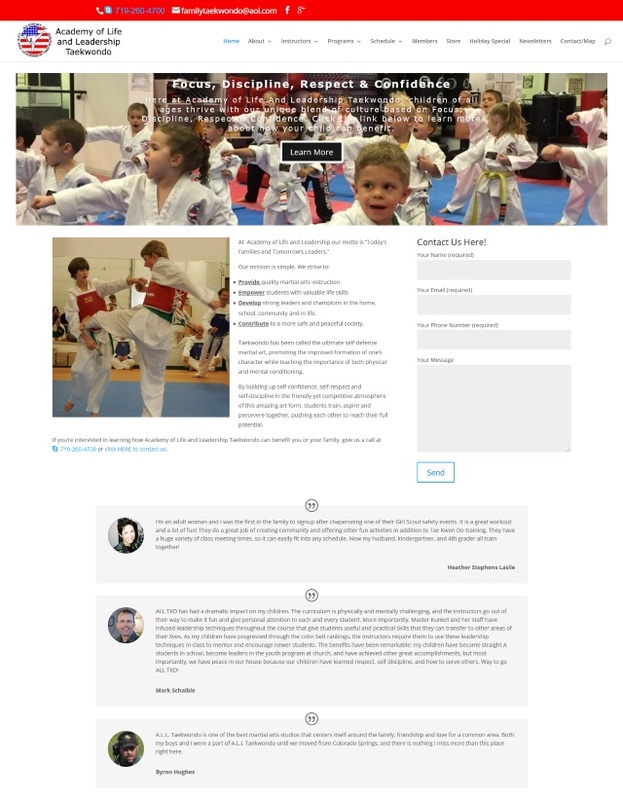 One of the premier taekwondo and self-defense academies in Colorado Springs, Academy of Life and Leadership Taekwondo experienced several positive results within the first month of converting to a lead generation website. Bounce rate dropped 25% within days. Bounce rate decrease (the percentage of visitors who enter the site and then leave (“bounce”) rather than continuing on to view other pages within the same site. Wikipedia) meant that more visitors stayed on the site and were finding content they liked. Contacts to the business increased dramatically due in part to the contact form right on the front page. All in all a successful implementation of a lead generation website (an asset) that is paying for itself with new business delivered to the business. If you’re looking for a great family-oriented self-defense training center, then Academy of Life and Leadership Taekwondo is your place. Why not give them a call now at 719-260-4700 or visit their website at http://family-taekwondo.com/ . Colorado Springs Insurance, Inc. is a great example of a well-done lead generation website that’s turned into a great long-term asset for the business. Offering a simple but effective design, the website offers fast and easy contact by multiple means (phone, email, office address) and great use of content. This website consistently ranks on the first page of Google for several high-dollar insurance search terms and regularly helpe lead new clients to a great insurance experience in Colorado Springs.